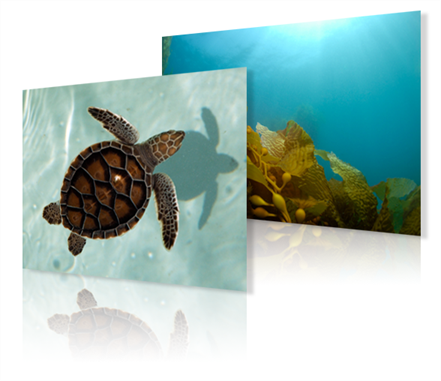 Once you created a bitmap layer, it is possible to add more images inside it. 1. Select Element > Add > Image. The new image column is added to your scene. 1. In the Timeline View toolbar, click the Add Layer button. 2. Choose Image from the Type list. 3. Enter a name for your new image layer in the Name field. 4. 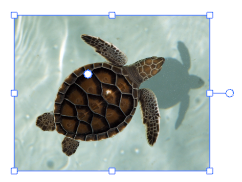 Choose how many image layers you want to add to your scene using the Number field. 1. In the Exposure Sheet View toolbar, click the New Image button. The new image element is added to your scene. 1. In the Timeline or Exposure Sheet view, select the cell into which you want to import the image. ‣ Timeline View: Import Images > Import Images. ‣ Exposure Sheet View: Import Images > From File. 3. Select the desired bitmap image file. You can select multiple image files if needed. 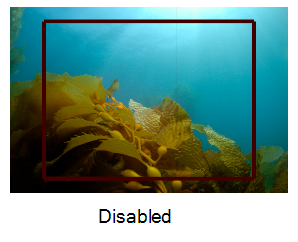 The image is imported in the selected cell. You can vectorize a bitmap after it has been imported to your project. You can do this by using the Convert Element to Vector option or a regular Copy/Paste command. ‣ Select specific cells in the right side of the Timeline view. ‣ Select the full Image element by clicking on it in the left side of the Timeline view. 2. Right-click on a selected cell and select Convert Element to Vector. The files are converted and a new Drawing element containing the vectorized files is created. 2. Select Edit > Copy or press [Ctrl] + [C] (Windows) or [⌘] + [C] (Mac OS X) to copy the cells. ‣ Select a cell in the Drawing element in which you want to paste your copied cels into. ‣ Select the entire Drawing element in which you want to paste your Image element into. 4. Select Edit > Paste or press [Ctrl] + [V] (Windows) or [⌘] + [V] (Mac OS X). Your cells are copied and simultaneously converted into vectors. In Toon Boom Studio, you can import bitmap images and vectorize them. 1. 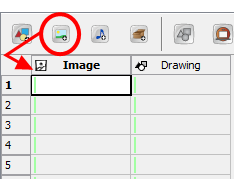 In the Timeline or Exposure Sheet view, click the Add Drawing Element button if you do not already have an empty drawing element in your scene. The new drawing element is added to your scene. 2. In the Timeline or Exposure Sheet view, select an empty cell. 3. Right-click in the empty cell and select Import and Vectorize > From File or select File > Import and Vectorize > From File. 4. Locate the bitmap image file(s) you want to import and vectorize, and click Open. You can select multiple files if necessary. 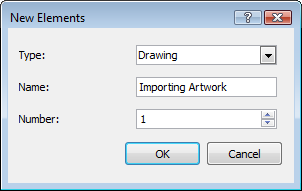 The Import and Vectorize Options dialog box opens. 5. Click Preview to display your image in the preview space. Click Preview every time you change the settings to update the result. 6. Click the plus (+)and minus (-) buttons to zoom in and out in the preview space. ‣ Files: This field displays the image you selected to browse. You can click on the browse button to change your selection. Black and White: Vectorizes the images in black and white. 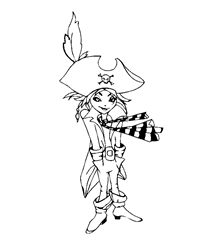 This is used when vectorizing line art that can be coloured in Toon Boom Studio later. This makes use of the Filters options described later in this section. With Texture: When the Vectorization type is set to With Texture, Toon Boom Studio imports the bitmap and applies it as a texture on a vector shape. This allows for direct manipulation of bitmap images within Studio. No Filter: Vectorizes without applying a filter. Smoothing + Loss Of Sharpness: Smooths the image. This process causes a loss of sharpness of the original image. Smoothing + Greater Loss Of Sharpness: Smooths the image. 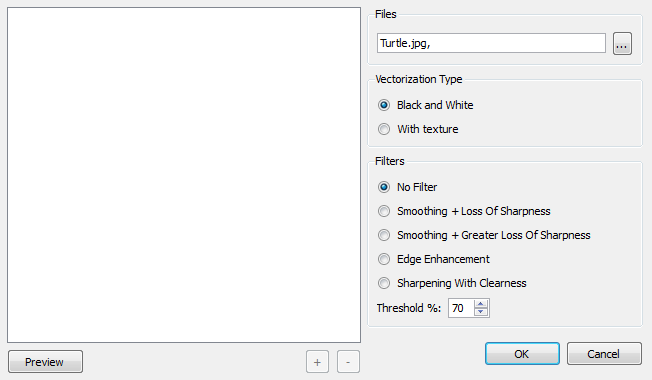 This process causes a greater loss of sharpness of the original image than the option above. 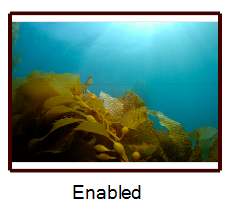 Edge Enhancement: Enhances the edge of the image, resulting in a more precise result. 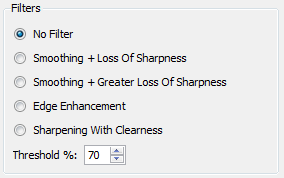 Sharpening With Clearness: Sharpens the images, resulting in a more precise and clear result. Threshold%: Lets you adjust the threshold value. The greater the percentage, the more grey pixels are allowed into the final vectorization of the line.